Hydrophobic Interaction Chromatography (HIC) is a powerful tool for the process purification of biomolecules. The technique utilizes the accessible hydrophobic regions located on protein surfaces and their interactions with a weakly hydrophobic stationary phase. Proteins and other molecules with hydrophobic surfaces are attracted to the hydrophobic ligands of HIC resins by employing an aqueous high salt mobile phase. The salt conditions contribute to a lyotropic effect which allows the proteins to bind to a hydrophobic ligand. Proteins are eluted by decreasing the salt concentration. Most therapeutic targets are eluted in a low salt or a no salt buffer. Since HIC separations are done under mild eluting conditions, biological activity is typically retained. HIC is an excellent complement to ion exchange and size exclusion chromatography, particularly when protein isoforms exist or when feedstock impurities are of similar isoelectric point or molecular weight. The selectivity differences exploited by HIC can also be used after affinity separations in which closely related proteins with similar recognition sites are not distinguishable by the affinity ligand. TOYOPEARL HIC resins are functionalized versions of the TOYOPEARL HW size exclusion resins and are therefore based on hydroxylated polymethacrylic polymer beads. Tosoh Bioscience offers five HIC ligands featuring different degrees of hydrophobicity and selectivity. 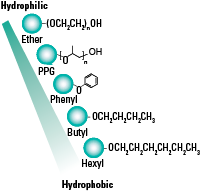 The hydrophobicity of HIC resins increases through the ligand series: Ether, PPG (polypropyleneglycol), Phenyl, Butyl, and Hexyl. TOYOPEARL and TSKgel Ether hydrophobic interaction chromatography (HIC) resins have the highest hydrophilicity (lowest hydrophobicity) of the HIC ligands offered by Tosoh Bioscience. The Ether ligand is useful for very hydrophobic molecules such as membrane proteins. It is typically used in intermediate purification and polishing steps. For high performance separations, the use of TSKgel Ether-5PW media is suggested. Both TOYOPEARL and TSKgel Ether products have the same selectivity. TOYOPEARL PPG (polypropylene glycol) hydrophobic interaction chromatography (HIC) resin has the second highest hydrophilicity (second lowest hydrophobicity) of the HIC ligands offered by Tosoh Bioscience. It has been optimized for the purification of monoclonal antibodies and is used as an intermediate purification or polishing step. It has extremely good capacity and recovery for mAbs. TOYOPEARL and TSKgel Phenyl hydrophobic interaction chromatography resins are located in the middle of the hydrophobicity range of the five HIC ligands offered by Tosoh Bioscience. Primary applications are for the separation of proteins, their isoforms, and aggregate removal. It is typically used in intermediate purification and polishing steps. For high performance separations, the use of TSKgel Phenyl-5PW media is suggested. Both TOYOPEARL and TSKgel resin products have the same selectivity. TOYOPEARL Butyl hydrophobic interaction chromatography (HIC) resins have the second highest hydrophobicity of the HIC ligands offered by Tosoh Bioscience. There are three pore sizes available for this ligand and each has been optimized for a specific molecular size profile. The primary applications for TOYOPEARL Butyl resins are the separation of proteins, their isoforms, and aggregate removal. Butyl resins are typically used in intermediate purification and polishing steps, though they can also be used for capture of your target molecule. TOYOPEARL Hexyl hydrophobic interaction chromatography (HIC) resin has the highest hydrophobicity of the HIC ligands offered by Tosoh Bioscience. It is used for very hydrophilic proteins or where a low salt elution environment is required. It is useful as an early capture step or for intermediate purification.